Tips for keeping your garden green without using too much water. After two very dry winters and recent mandates to conserve water, many of the Bay Area gardens I’ve been in this summer are very parched. So parched that the soil has become “hydrophobic”—meaning that when you do water your plants, the soil repels that water, just like a dry sponge does. In fact, soil is very much like a sponge: If it is fully saturated, it will take a drop of water and efficiently wick it throughout a large area. If soil is completely dry, water will bead up and roll away. It may sound strange to advocate for using more water in a drought, but properly saturating the soil will actually reduce the amount of water needed to keep your plants healthy. Once soil is fully saturated, it will hold that water—and make it available to your plants. 3. Work in compost annuallyCompost improves the structure of the soil, allowing it to hold more water. 4. Add mulch to reduce evaporationBesides helping to hold in water, reduce weeds, and protect roots from extreme temperatures, mulch also increases biological activity as it decomposes. Increased biological activity makes your plants healthier and stronger—better able to resist drought. 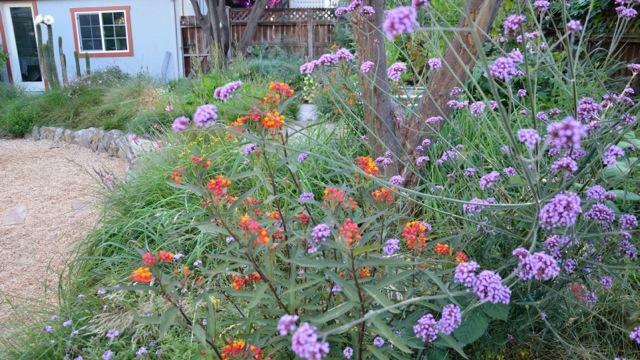 Guest blogger Andrea Hurd is the award-winning landscape designer behind the Bay Area’s Mariposa Gardening & Design.